This is an, um, interesting statement. For one, most residents in Seattle don’t live in families – and the vast majority of new residents are single. Less than 5% of the city is composed of households greater than four people. Most of the renting families we know in the city don’t actually live in “stand-alone single-family houses”. Personally, we family rents a two-bedroom accessory dwelling unit (ADU). Many of our friends with kids live in apartments, townhomes, or duplexes. Several of our neighbors are single parents who live in apartments or condos–despite the claim above, these are all families, living in “family-sized housing”–that aren’t detached houses. The belief that detached housing is the best option for families is dated and frankly privileged. Households in this city are incredibly diverse – nuclear families, blended families, single parents, cohabitating parents, extended families, intergenerational families, adopted families, and multitudes more. The notion that a singular form of housing (detached homes), increasingly accessible only to the wealthy, can accommodate them is, to say the least, misguided. Multifamily housing is illegal on over 80% of the land where housing is legal in Seattle. Our state’s condo liability laws have ensured that almost no new condos have been built in the city’s largest housing boom to date. On Tuesday, The Seattle Times ran an article stating that the median price of a single-family home in Seattle is $830,000, having increased over $100,000 in the last year. This means the collective value of single-family homes–driven largely by zoning-enforced scarcity–in just the last year, increased by nearly $14 billion dollars. Billion. That kind of wealth would fund nearly 50,000 family-friendly homes. Do we not have a housing crisis? Zillow shows a whopping 32 homes with more than two bedrooms for rent under $2,500 per month. Only two are within a couple of miles of Downtown Seattle. Several are short-term leases. Most of these homes are old, poorly insulated, and have high utility bills. Many are also on loud, polluted, dangerous arterials. They aren’t great options for families. The nearly citywide ban on multifamily housing is not, in fact, a family-friendly policy. If upzoning is “anti-family”, then downzoning must be “pro-family”. However, we know from the history of zoning, the stagnation and depopulation of single-family zones, and the increasing lack of affordability due to a nearly citywide moratorium on affordable, multifamily housing –this isn’t true. Failing to upzone and accommodate more family-friendly, multifamily housing will only ensure that those who aren’t wealthy will have fewer and fewer options. We’ve been watching this play out across the city for years. If we want to see families (of all types) thrive in this city, we need to let go of classist norms that price them out. We need to revise land use policies so that multifamily housing is legal everywhere housing is legal. We need to remove owner-occupancy requirements for ADUs and backyard cottages so they can be accessible to a larger share of families. We need to make much more room (yes, upzones) to allow family-friendly, livable forms of housing such as cooperatives, baugruppen, cohousing, and social housing. But on top of that, “family friendly” policies need to allow multifamily housing near parks –so that children have places to play, they need to prioritize mobility –through increased transit and bike infrastructure –as many young families are ditching cars for transit and bikes, they need to allow multifamily housing near schools. All of these things also happen to be incredibly sustainable. We’re supposed to be one of the most progressive cities in the United States, but our land use policies are some of the most regressive. We will never achieve our climate goals without addressing this. Seattle is sitting at the confluence of a hundred years of anti-multifamily housing, poor planning, and condo liability laws that overly restrict non-traditional forms of housing. Multifamily zoning and single-family zoning are the exact same use –dwelling –and preventing new residents who aren’t wealthy from 80% of the area where dwelling is legal, is a recipe for ever-expanding inequality and economic segregation. As the city continues to skew younger and majority renter, this will only magnify. We need widespread acceptance of the need to change zoning in this city (and region), and we need our land use regulations to recognize and accept the multitude of household types and their vastly different economic circumstances and habitation preferences over the privileged norms of the last century. A better, more livable, and more sustainable world is possible – but it requires re-legalizing family-friendly housing. Everywhere. This is a cross-post from Mike Eliason’s blog on Medium. The title image is a pre-zoning condo in a downzoned single-family zone courtesy of Google Streetview. Well said. There is no vision for a sustainable, equitable Seattle that doesn’t involve some evolution of Seattle’s single family neighborhoods. It is high time we develop that vision, rather than putting our heads in the sand on the issue. I have a couple of ideas. First, let’s expand and upzone Urban Villages, areas within a 10-minute walk (0.4 miles) of neighborhood retail and great public transit. No more SF zoning within those UV walksheds. And second, identify and plan what I call Micro Villages, neighborhood crossroads with a little small retail going on — think 15th & S. Oregon (MacPherson’s produce) and nearby Columbian Way & Beacon Ave. A little narrower walksheds and not quite so high density as UVs (4-floor apts instead of 6). This is just building on the Urban Center and Urban Village concepts baked into the City’s comp plan back in 1994. Stop trying to abolish SF zoning everywhere, especially in areas with few or no sidewalks or where you have to drive to buy groceries. So how do you prevent places like queen anne and phinney from minimizing their urban village upzones? Those places have plenty of sidewalks and grocery stores, yet have managed to subvert the urban village upzone process and get tiny slivers of multifamily. The problem with the urban village plan is that it is so easy for wealthy neighborhoods with good amenity to wriggle out of it. Neighborhood Planning. The devil is in the details, and a planning process that involves citizens allows people to weigh in and work on those details. Call it community involvement (work I did professionally for years). Set deadlines, so it doesn’t become endless Seattle process. Not everyone will be happy with the result, but there’s merit in allowing everyone to have their say. One likely result is fewer delays due to SEPA appeals. “Neighborhood Planning” results in wealthy, connected residents keeping density out of their neighborhoods, regardless of any planning considerations. Every single time. You can see that from Queen Anne to the Pearl, to Noe Valley, to LA’s west side. You didn’t see that happening on Beacon Hill, where I was involved in Neighborhood Planning. Please don’t be stereotyping the process. It can be done right. But Seattle City Hall today doesn’t want to. They prefer to jam things through in a top-down planning model, even if it means delay and disruption — witness their handling of backyard cottages. You mean the same Beacon Hill Council that claimed they can’t accept new density because they’re in the Seatac flight path? Please provide a cite; the date that Beacon Hill council passed such a resolution. Not sure when you passed the resolution, but here’s the witness list you submitted for the MHA appeal. Your name in on there. At the time we were doing Neighborhood Planning, nobody was advocating extending MF zoning more than a block or two into SF neighborhoods. Perhaps if you were around back then, you could’ve enlightened us. The micro village sounds like a a great idea. It’s my impression that the current system may lock out the development of walkable neighborhoods in large outlying residential areas, and it puts other existing developed neighborhood cores that aren’t urban villages on a different footing from the ones that are. E.g., Magnolia. But, whatever – as you say later, it has to be with the assent of the neighborhood, out of a valid planning process that includes the possibility that the neighborhood may reject proposed rezones. I wish there was a forum where calmer voices could get together and hash out some of this stuff. Blog posts and comment threads seem to generate more heat than light. Under current Seattle zoning, in areas where multi-family housing is already legal, how many units are being built with 2 or 2+ bedrooms? My understanding is that the industry is building studios and 1-bedroom units; very few family-friendly units are being produced. Replacing old SF houses with more housing for single techies does nothing for families, however you define them these days. If just 1% of single family houses were replaced by 1 BR sixplexes, the market for 1 BRs would be flooded (that would be ~7,800 apartments, and there were only 7,500 apartments of all types built in Seattle proper in 2016). Long before then the industry would shift to address the unmet demand for larger apartments. Yeah, I think this is that original person’s point – that upzoning in some places does displace families and isn’t really family friendly. I think it is crazy the city doesn’t require a certain percentage of units to be 2 br + for buildings with over 9 units or something. Also there is a real lack of entry level priced 2 br + dwellings of any kind for sale – a lot of young families want to buy a home or condo. Under current Seattle zoning, in areas where multi-family housing is already legal, how many units are being built with 2 or 2+ bedrooms? Quite a few. Townhomes are still quite common in low-rise multifamily zones. I have a few friends who have bought new ones in the past couple of years. It does seem that one-bedroom and studio apartments are preferred where the zoning makes them more feasible, such as in commercial zones. This isn’t much of a surprise though. Given how much housing costs around here, it’s the rare household who will pay for more bedrooms than they need. A one-bedroom is plenty large enough for singles or even couples. About three-quarters of our households are just one or two people. A new home in a single-family zone isn’t going to be a one-bedroom. When most of the land is set aside for houses big enough for the ~25% largest households, should we really be surprised or dismayed to find that the rest of the land is being filled mostly with homes for the other 75%? Yeah, three quarters of our households are just one or two people because the families can’t afford to live here because there isn’t adequate family sized housing supply….. Per the US Census Bureau, 65% of the homes in Seattle have two or more bedrooms. 38% have three or more. We could use more homes of all sizes, but based on these numbers I’m having a hard time following the argument that we have an especially large shortage of family-sized homes. What we do have is an awful lot of single-family zoning. A large fraction of the family-sized homes are located in this type of zoning. Housing in these zones tends to be more expensive because land is expensive, and single-family zoning requires a lot of land per home. Legalize duplexes, triplexes, etc. 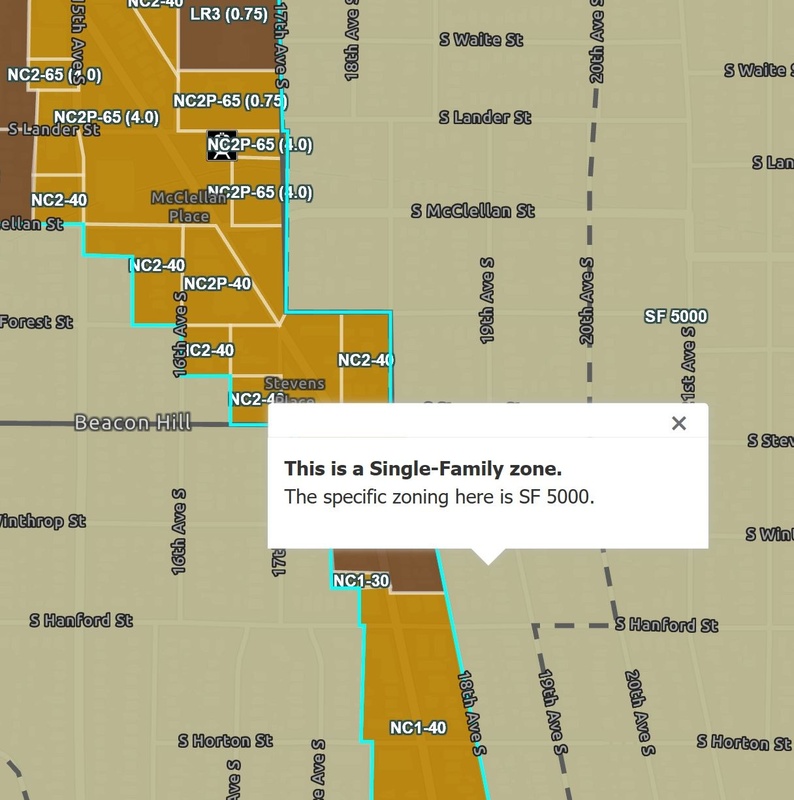 in these zones and you can get family-sized housing built much more affordably than the $1.5 million mini-mansions that currently dominate new construction in many neighborhoods.